The Seppala Siberian Sleddog is a dog formed by nature and function. His original environment was the cold Arctic, in which survival required a well insulated coat, low metabolism, small to medium size and over-all physical toughness. His original function was to pull lightly loaded sleds over moderately long distances at a rapid pace. His latter function was to race, usually over moderately long distances with little or no load. The following standard is meant to reflect and preserve this heritage. Attitude (25 Points): The Seppala Siberian has a positive attitude towards his work of pulling in harness, and a strong desire to please his owner. When raised in a healthy, wholesome, exercise-oriented environment, he will be amenable to light harness work by six months of age. In good physical shape, he will always pull, and if not totally exhausted or injured, he will never quit. He is always enthusiastic to start, whether at the beginning of a run or after a stop within a run. His desire to pull remains undiminished even after several days of running and resting. He always maintains a tight tugline within reason and subject to the limitations of his physical ability with respect to speed. Attitude is the number one consideration of a good sleddog, and it can be evaluated only under a stressful team situation, such as in a long tough race. Movement (25 Points): The over-all movement of a Seppala is effortless, smooth, flowing, graceful and has a powerful forward thrust. He is light on his feet, quick in his action, balanced and smooth in his forward progress. No choppiness or exaggerated movements by any of his body parts - legs, shoulders, head, buttocks, etc - should occur. He should never appear clumsy. The limbs should travel in straight forward paths, the head should be held low, the tail should be down and at a fast trot or more, he should single-track. At an easy lope he may have a slight up and down movement but no excess energy should be used in vertical movement, which should occur only to allow momentary relaxation of the limbs. At a fast lope his head should be straight out or down like he is trying to eat the trail, and his motion should be totally directed forward. His power should be coming from his rear end, and he should never appear to be pulling his body from his front end. When moving and pulling at a rapid pace and viewed from the side, he should display a long front end reach (stride) without undue upward movement of the head, and a well extended rear movement, both backward and frontward. Viewed from the rear he should single-track and show a powerful rear thrust. The front and rear movements should be balanced and synchronized. There should be absolutely no distortion of body movement, such as crabbing, hackneying or slow-motion double suspending, to accommodate the front and rear legs under the body. Movement should be evaluated in a pulling situation at speeds greater than 12 miles per hour to be correctly assessed. Front End Angulation (20 Points): The front legs should be set well under the body, with the angles the shoulder blade and upper arm make with the vertical passing through the point of the shoulder approximately 45 degrees. See figure 1. A ridge runs from the point of the shoulders to the top of the shoulder blade and can be usually located by finger tips in approximately the center of the blade. The line following this ridge should make an angle of approximately 45 degrees with the vertical when the heel-pad stands directly under the center of the shoulder blade. Rear End Angulation and Flexibility (20 Points): The rear stifle should have a pronounced bend producing a moderate to well angulated rear and should be moderate to long in length. When the hock is vertical, the angle between the femur and pelvis at the hip joint should be less than 100 degrees, with 90 degrees being preferred. It is very important that the stifle and hock be flexible. This determines how well the dog uses his rear angulations. Little effort should be needed to straighten out the rear leg at the point of the hock and above. A dog should be able to stretch his rear leg in a straight line as a normal course of events. An indication of stiffness is when the legs remain bent at the point of the hock even when the dog stretches. Moderate rear angulations with extreme flexibility is ideal. 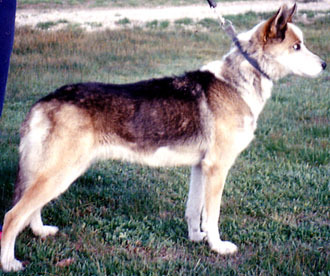 General Structure (10 Points): The Seppala is a natural dog weighing between 30 and 60 pounds and standing 19 to 24 inches at the shoulders. The ideal is 48 pounds and 23 inches for males, slightly less for females. The head should be of moderate size, finally chiseled and can be either wolf-like or fox-like in appearance. The ears are tall, set close together on top of the skull and moderately rounded at the tips rather than pointed. Although not desired, no penalty should be assessed for floppy ears. Stop is moderate with no penalty for too little or too much. Bite may be level or scissors. The neck should be arched and moderate to long in length, never short. The back should be of moderate length, neither too short or too long, and be proportional to height. The length from the point of the shoulder to the back of the buttocks should be about 112% of the height of the dog at the withers. The croup is rounded, sloping downward from the top of the hipbone to the tail set giving the appearance of a wheel segment. The tail should come out horizontally or lower, and never be a snap tail, a ring tail, or come out to the side. When pulling, the tail should be held low down. The rear stance should be sturdy and sound, neither too narrow or too wide. It is very important that the rear legs track strictly behind the front legs (single track), never outside them with one or both legs (crab), and sparingly inside (double-suspend). The lower chest should extend well back (deep) with a pronounced tuck up between the chest and stifle. The fore chest should be narrow to moderate in width and extend well forward of the legs. The complete chest should have the appearance of a boat keel. A good thick, large, firm flexible foot with well-cushioned pads is important. Splayed out, flat, soft or tiny "cat feet" are not desirable. All pad colors are acceptable. The pasterns should be strong and flexible, but never to the point that they flatten out (go down). The Seppala coat is a "plush" coat in which the undercoat is practically as long as the guard hairs. The coat should be soft and of sufficient thickness to protect the dog in extremely cold temperatures, for example, at minus 40 degrees. A heavy coat is proper, but the long, dense "wooly" coat is not desirable. Long, flat, possibly wavy coats and short coats with no or little undercoat are faults. Coat color can be anything and in any pattern. It is preferable that nose, lips and eye rims are black, but not a fault if they are not. The Seppala personality is a happy, curious, intelligent one that properly socialized is a joyful companion. He has high energy that needs to be regularly exhausted. He can be predatory towards smaller animals but is well socialized towards his own kind once a heirarchy has been established. He is never aggressive towards people. The Seppala has a low metabolism requiring minimal food for a dog his size. His low metabolism and well insulated exterior make an extremely efficient sled dog. Summary:Nature and function have formed the Seppala Siberian Sleddog. Nature and function should be always given the highest priority in his continuation.